Almost two years ago to the day, I read Arthur Koestler’s Arrival and Departure*. That, unfortunately, didn’t really thrill me so much. I’d heard that Koestler was a master, I’d heard he was a gifted and skilled and emotive politicised novelist, whose cruel pen was able to render the horrors of European dictatorships with the precision of Solzhenitsyn**, but with a more nuanced, internationalist and intellectualised – rather than physically experienced – tone. I found that novel a disappointment – vague without being distanced, plot-heavy without being exciting, whereas I found this***, Darkness at Noon, a deeply moving and intellectually stimulating novel, able to be simultaneously emotive, politically discursive and historically relevant. 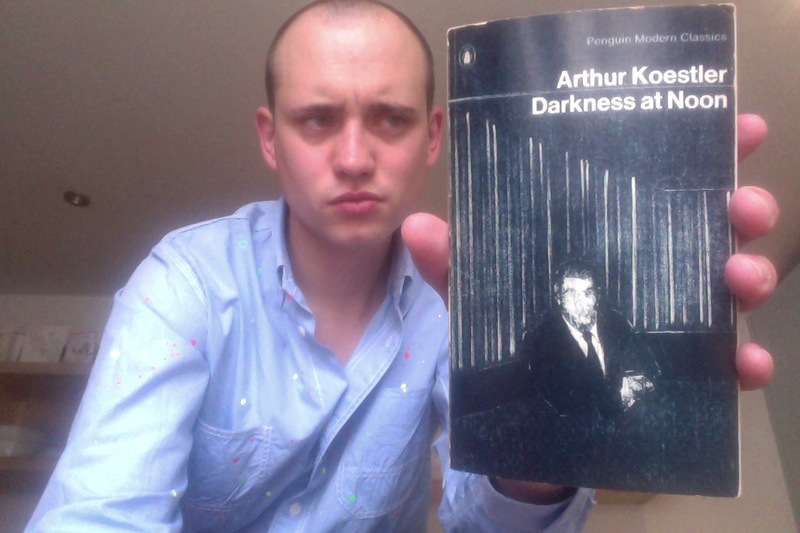 This, Koestler’s seminal text, is great. Darkness at Noon is about Rubashov, a former top light in the post-revolutionary government of a left-wing European dictatorship in the first half of the 20th century. Obviously, though pointlessly never directly stated, this is Communist Russia, the USSR. Rubashov was the man sent out to try and incite communist support throughout Europe: in Belgium, Germany and France. He was responsible for denouncing those of strong convictions who wouldn’t toe the party line, or making those of weaker stature change their opinions as the dictatorship of the idealised state became increasingly corrupt. During his time travelling, Rubashov became more aware of the problems with the regime, and after arrest and torture in (again, implied) Nazi Germany, he returned to his homeland to recuperate, where he saw the true departure from the meaning of the revolution and asked to be posted abroad again. This was his mistake, and the novel opens with his arrest, a couple of years later, as a dangerous member of the illegal, unofficial and uncollected opposition, almost immediately after he retires to (we presume) Moscow. The reader discovers Rubashov’s past through a series of flashbacks, constructed both as daydreams while he idles his time in goal, and as disputed reconstructions during the one-on-one interrogations he is put through behind concrete walls. We see snippets from his diaries, hear his coded conversations with other political prisoners (almost all of whom possess different, but equally unacceptable, political ideologies) and witness his internal philosophical development as he accepts the false charges that are applied to him. Yes, Rubashov had a few conversations pointing out the faults with the system of his country, but, no, he did not apply his opinions onto any direct action. However, a logical man, he accepts his guilt, because he knows that to act upon any of his reactionary thoughts could have led only to civil war, to violence, and to murder. He acquiesces to every charge of terrorism and calmly accepts his death sentence, dying in silence: not as a crowing martyr, but as a wounded, unredemptive, christ. That was a long synopsis, and not the kind of thing I usually do with my reviews on here. The reason why I’ve made such an uncharacteristic exception is that I feel an understanding of the plot of this novel is secondary to an understanding of the message and the ideas it is trying to explore. There is long and borderline labourious discussion of the classic debate between whether or not the end of a revolution justifies the means. Koestler, here, kind of argues that it does, that it should, but that it never will. Never will a revolution mired in blood be able to turn itself into an arcadian**** wonderland. Milk and honey are not the produce of war, they are the produce of agriculture. Well, and apiculture*****. To conclude, though, Darkness at Noon is very physical, is very involving and is very intense. One feels the weight of Rubashov’s mind and experience, one feels the threat but the inevitability of his execution and wills him to formulate his thoughts into the way best suited to him. I did not read the novel hoping for a last minute escape attempt, a last minute reprieve, or for him to shout resistance as he died, because the novel was about a state blindly following a political path until it was too late to backtrack from the violence it had intrinsically unleashed. Rubashov could no more escape than Russia itself could. And it wouldn’t, not for ages. Koestler even semi-predicts, in here, the Korean and Vietnam wars. It’s all unavoidable, is history. The universe is finite, so are the outcomes of any action. Rubashov is brave and intriguing, but he is a dead man from the first page. Highly recommended, but does require a bit of engagement. * Click here for a review by my floppy-haired, younger, less discursive self. ** There’s an ancient review of his famous one here. I think I might’ve been doing this blog for too long. *** Two years on, where I am now older, balder, more cynical but less depressed. Also far better read, better informed and much more of a grown up. ***** The way you can tell I’ve got an English degree from a mediocre university is that I had to check that before typing it. ****** Last week I met a pole-dancer called Isis. I wish that was a lie, but it’s not. I read this years ago and found it to be a powerful novel. I mean to read it again as I think I’d appreciate it more now. I enjoy reading your book reviews. You seem like an interesting person. Keep up the good work. Feel free to email me if you want to correspond about books. I just got done reading Maugham’s The Magician. Ah, don’t confuse despairing with interesting.